Fun Fieldz | We Take The Ball Game Out To You! We Take The Ball Game Out To You! Fun Fieldz is a unique way to bring kids, adults, family and friends together to play. Whichever sport you choose, Fun Fieldz will find a way to have everyone participate and build lasting memories. You Choose The Sport, We Bring The Field and the FUN! Fun Fieldz brings a range of miniature, authentic sports fields to your location to create a unique and memorable big league experience. Yes, we bring the ball game out to you! If you don’t have a big yard or an ideal spot for Fun Fieldz, no problem! We have partnered up with several local locations to provide our clients with the space to host Fun Fieldz events. We have indoor locations as well for events in which weather may be a factor. 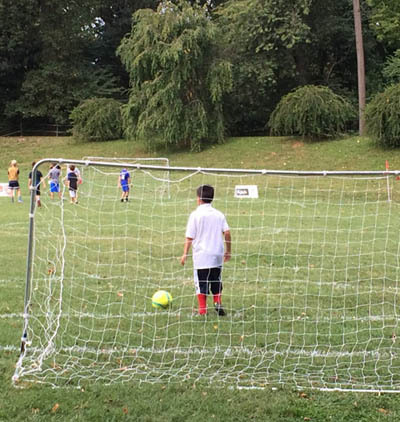 The newest addition to our Fun Course package, this is the wackiest soccer you’ll ever play! Perfect for every event, location, ability and age! We custom fit our “fields” to fit your location. We bring everything to you including the equipment, the coaches, fencing, field lines and most importantly, the FUN! If you are planning a birthday party, corporate team building day, family reunion, fundraiser, or any other event, Fun Fieldz can help you make lasting memories for everyone to enjoy. 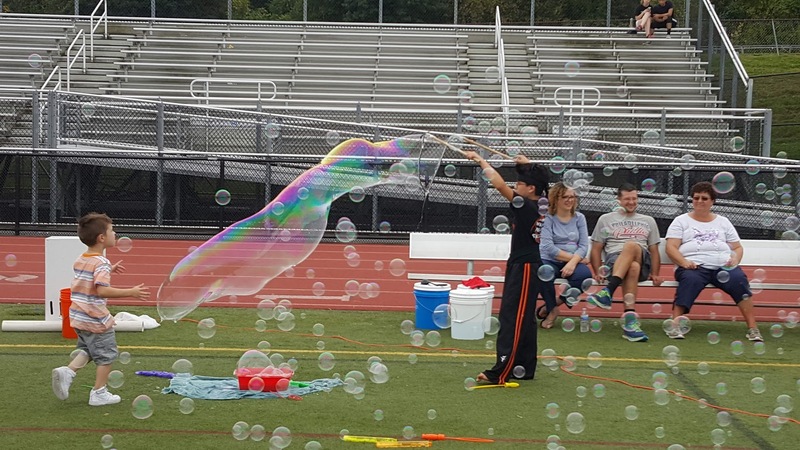 Add Bubbleland To Your Event! Who doesn’t love bubbles? 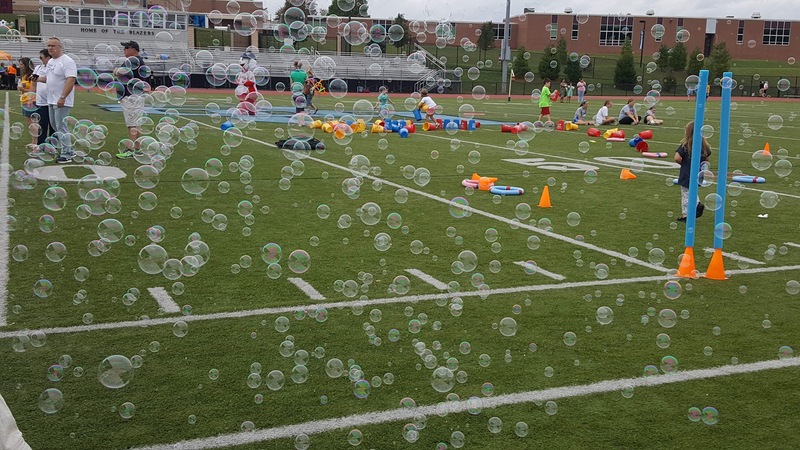 Bubbleland is an event add-on that is everyone loves! Contact us today to learn more adding Bubbleland on to your event package. 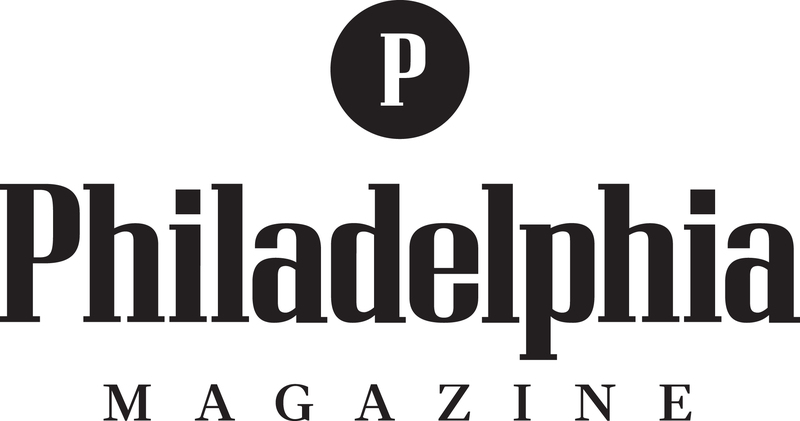 As a professional Event Planner, I am very fortunate to be surrounded by extremely talented event professionals and have many options to choose from when it comes to planning my own personal parties and events. I had the opportunity to meet Fun Fieldz thorough an event I was planning for a corporate client and knew they would be the perfect fit for my son’s upcoming birthday party. A sports crazy 3 year old, all he could talk about was having a “baseball birthday party”. Fun Fieldz was able to bring that request to reality. 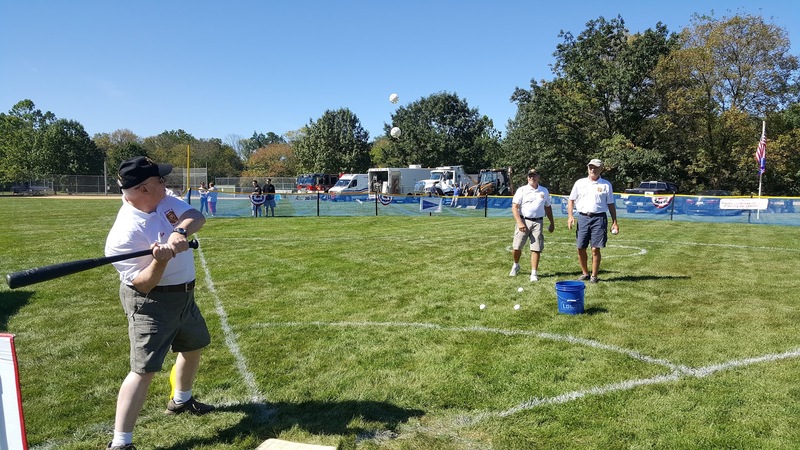 On party day they transformed our backyard into a real baseball field, complete with banners, bases and even a major league sound system! When party day came and many of our guests unfortunately had to cancel last minute due to sickness, etc – the guys from Fun Fieldz never let it be a problem. They not only were able to keep the attention of very active 3 and 4 year olds, but also got many of the “older kids” aka parents at the party to join in the fun! 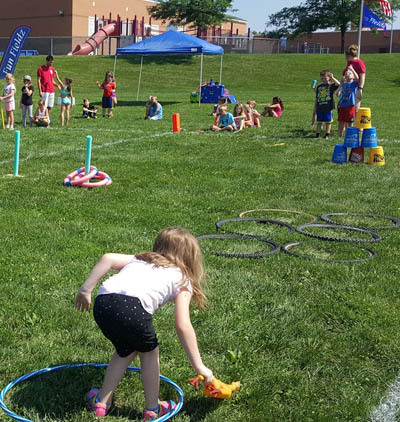 My job as an Event Planner is to provide top level service and professional referrals to my clients – I will surely be referring Fun Fieldz to my clients (and will definitely be bringing their fun to my backyard again in the future!) Amanda D.
We hired Fun Fieldz for my son’s 10th birthday party. 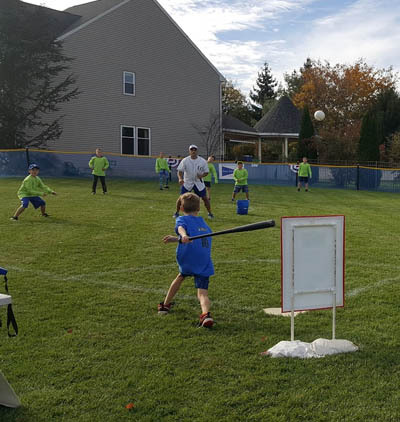 They arrived early to set things up and had the 20 kids playing wiffleball for 2 hours (ages 7 – 11!!!) I was shocked they all played for that long. Jon who was MCing kept the kids entertained and having fun!! Aaron was the DJ and played all their favorite music throughout the party. My husband and I (the party hosts) did nothing but watch!!!!!! THANK YOU FUN FIELDZ! Sarah P.
We had Fun Fieldz come out to an event for Montgomery County Down Syndrome Interest Group (MCDSIG) and it was a blast. All the kids and adults had a great time. The staff was incredible and made everyone feel like a champ! There was something for everyone! I highly recommend them! Brian W.
Fun Fieldz Is Offering Franchise Opportunities! Own and operate a home-based, fun business that combines our favorite team sports with production and outdoor seasonal events. 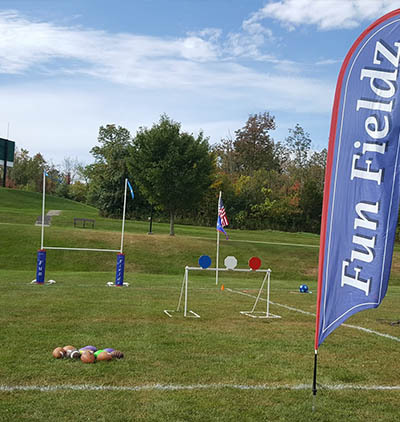 Ready to have Fun Fieldz at your next event?